As I have previously written, I haven't been doing much in the way of crafting or card making lately. I have been out and about enjoying summer and spending time with family and friends. I had to make an exception to my break when I was asked by a partner at the firm I work for if I could make a special card for him to give his wife for their anniversary. He had never asked me before (normally, I make them for assistants and a few other staff members), so I said yes. The only guidance he gave me is his wife loves color and flowers, so this is what I came up with. Here is another example of one card using three stamp sets by different companies. It is a fun way to get the most of the many supplies I have and give the sets a different look. It felt so good to get my fingers inky! Hoping to just find time to create for myself soon. I know I have relatives coming next week and a block party to attend next weekend as well so I am not sure when I will fit it in. Summer is really in full swing here! If it is summertime in your area, I hope you are having a lot of fun and family/friend time, too! It seems like your getting quite a reputation for your fine craftsmanship as a carmaker at your firm, and I certainly know why, my friend. I love the way you combined the 3 stamps into a beautiful composition which is certain to delight the recipient. Blessings! I'm happy to hear that you are out enjoying life. Don't get me wrong, I love to craft, but living life in various ways gives us so much more incentive, insight and motivation to create when the mood strikes. There is so much more to life than living with an stamp in your hand! A lovely card and the verse would certainly make me happy on my anniversary! Happy to hear you are having a good summer! 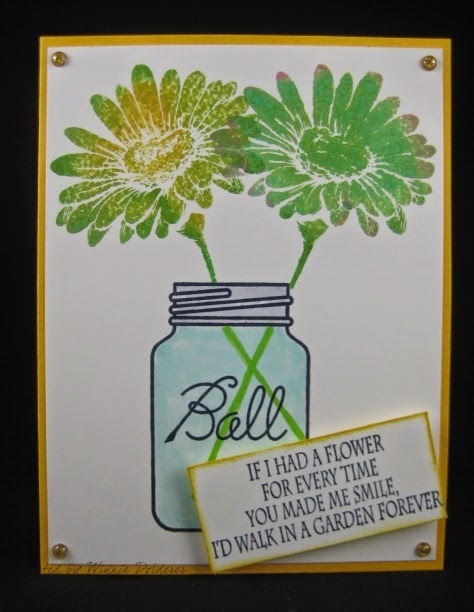 What a lovely card using one of my favorite things -- jars! Love that sentiment too!! Such a pretty card - that "jar" is amazing! It's just lovely! It's a wonderful sentiment and I'm sure the wife will be thrilled to get it. What a thoughtful husband.